Now, listen, don’t get too carried away with this one. We don’t want to read any headlines of professors getting kidnapped or anything like that. In fact, as your attorney, we suggest that if you are one of those folks who dives in a little too deep, perhaps this Daily Create is not for you. 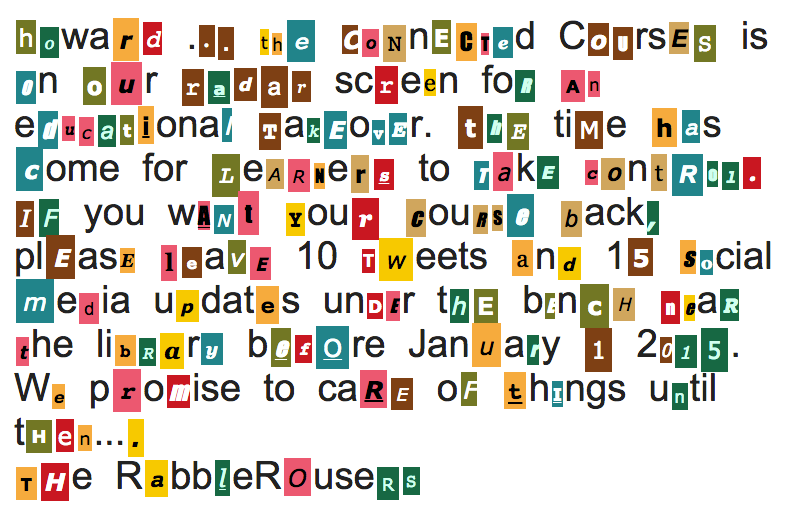 But, if you are looking for a little creative adventure in your day, why not create a Ransom Note for someone else in your network? What will you “kidnap” and “ransom” in a note? Hey, that’s up to you. As your attorney, we cannot offer up suggestions. But our phone will be ready when you need to post bail. Create a ransom note with the Ransomizer generator. It does not save as an image so you will probably have to do a screenshot. Be sure to share out. And be sure to return anything stolen during the making of this create. We miss our words. ← #Dailyconnect: Where Do You Go From Here? Who/what would an #adjunct❛kidnap❜&❛ransom❜in a note? For what❛ransom❜?